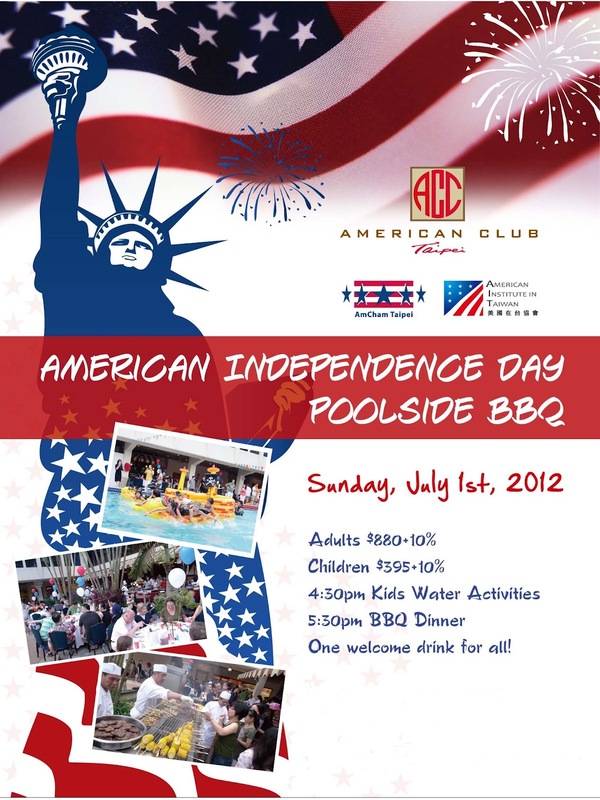 Our big July 4th, Independence Day Celebration back-in-the-day would have taken place on July 4th, America's Birthday! The military clubs always laid-on a big day of food and fun. Many of us would have flocked to beaches around the island, the day would have hosted ball games and BBQs at many places. It would have been a joyful fun filled day for all. Few American folks who reside in Taiwan this year will have the day off on July 4th. So, most if not all of the celebrations and parties are taking place on Sunday, July 1st this year. The American Club Taipei has put together a special celebration. The American Chamber of Commerce along with the American Institute in Taiwan (AIT) appear to have co-sponsored the event. I checked-in at the American Institute in Taiwan website here I couldn't find anything on the celebration at the American Club Taipei, although the information could have been buried inside their web site somewhere else. It's Sunday Morning in Taipei as I compose this page. The festivities will soon begin at the American Club. Expect there are folks at the American Club having breakfast this very moment. We hope your July 4th celebration is filled with family and friends experiencing joy and happiness together, remembering our country's birthday. No Bud Lite in Taiwan! 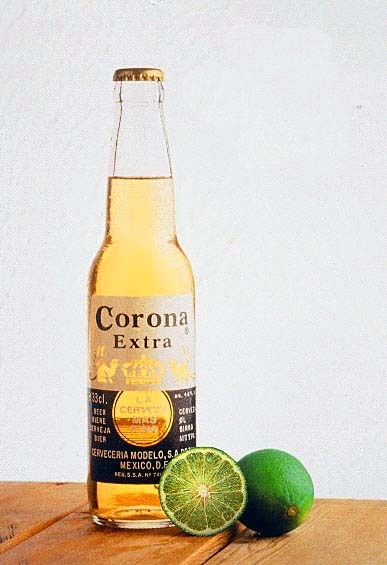 You can get a Carona. When in Taiwan, I prefer Taiwan Green Label. Careful with the fire crackers! Jim Dwyer over at the CCK Facebook Page posted a beautiful video. Most of the folks who frequent this Blog are Vietnam era folks. Ralph Henricks, the Base Procurement Officer at Tainan Air Base during 1967-1969, sent me a CD containing many photos of Tainan AB and the surrounding area. I posted some of his photos on the Taipei Air Station Web Page a few months ago, you can see them HERE. Today, some interesting photographs Ralph took over a long period of time in 1968, as work on a new water line stretching from a mountain reservoir above Tainan made it's way along Ta Tung Lu Road toward the main water purification plant. "It was a project of the City. I have several photos of the operation because it took a loooong time to complete and was a good chance to see how things were done in Taiwan in those days - everyone worked very hard - especially the women! Besides, it made the daily drive from home to the base a bit tenuous for several months and my son was very interested in seeing what was going on!" The street is torn up along here with dirt piled up in front of the shops. Maybe there is a walk path between the dirt and the shop entrances. The pipes are laid and the dirt is thrown on top. One wonders, did they lay a bed of small pebbles and sand down before the tiles went down? Everyone is interested, I'm not sure if these men are working on the line or just happen to be passing by and have stopped to observe. Had I passed by the job on foot or on my bicycle, I'd of stopped to nose around myself. It's tough to pass any large construction project without peeking inside to see what's going on. We've got kids hanging around the hoist, and a Mother with baby checking out the scene. Everyone has an opinion, and for sure, there were a lot of voices heard telling the workers what to do next, maybe not loud, but, nevertheless spoken. OK girls, lets fill it in. Lots of shovel fulls of soil to be moved, but, these women were working, bringing home wages, which sparked the economy of Taiwan. Looks like the children here, like kids anywhere in the world have found something to keep them occupied. Crawling through tiles will always bring a smile to a child's face. These children seem to be having fun, how fast days passed at their age. Lots of Bamboo hats in this crowd. There is one motor bike. The men are hanging around for some reason. Are they waiting for the possibility of being hired? Up ahead of the water line construction, this buffalo waits. Take a close look in his eyes and face, he seems to reflect an air of content and peace of mind. More of Ralph Henricks photos soon. Please leave your thoughts and knowledge of Tainan in a Comment below. 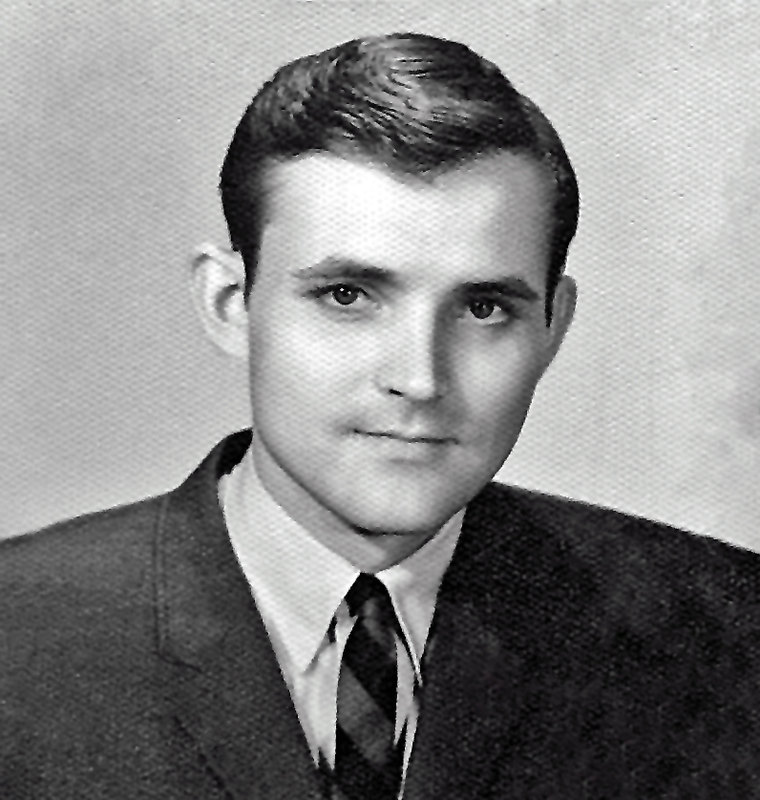 I was recently contacted by Bill Gray. Bill asked to be included in our Taiwan Personnel Listing. Bill was at Tainan Air Station for two different, 2 month TDY assignments with the 311th Fighter Bomber Squadron out of Osan AB, Korea, in the mid 1950s. 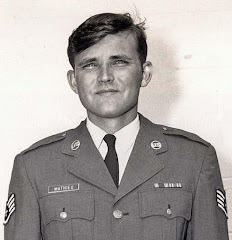 We were happy to add Bill to our listing, and will add anyone else who was in some way, associated with the US Military in Taiwan during our years there after WW II. You can E-mail us HERE to be added to the listing. In Bill's E-mail, he included a link to a Web Page he constructed in memory of one of his friends who was a pilot in the Korean War. On his Web Page, he writes of his two TDY periods in Taiwan and talks about some of the things that he encountered while there. 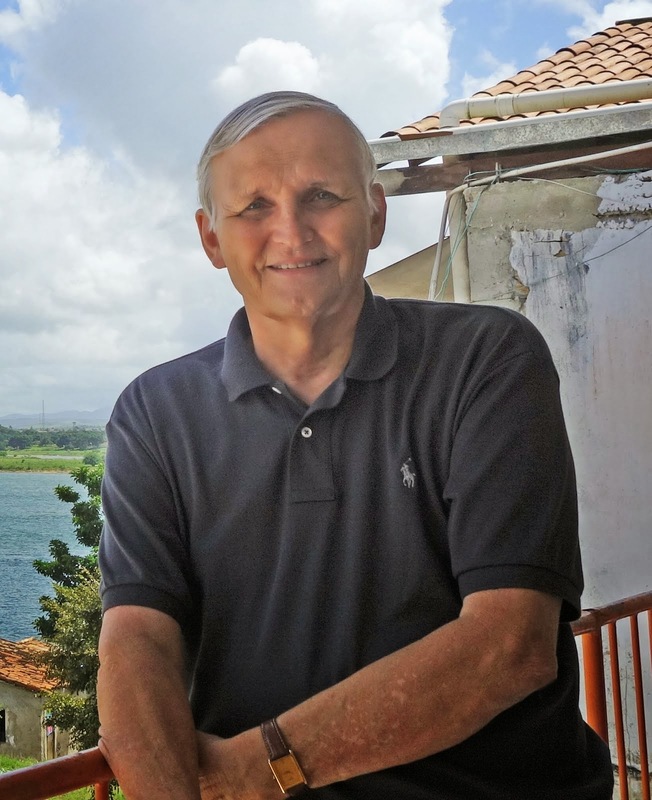 I asked Bill if I might re-print his Taiwan writings for this Blog. 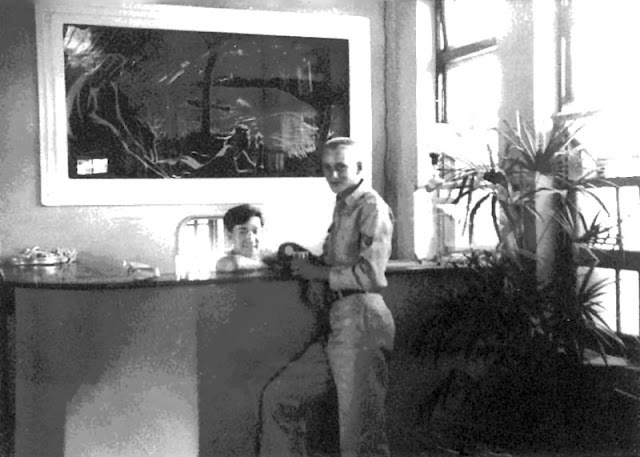 Below, Bill's writes of his days at Tainan Air Station. The three squadrons in the 58th Fighter-Bomber Wing --- 311th, 69th, 310th — rotated to Formosa for two month TDY tours. 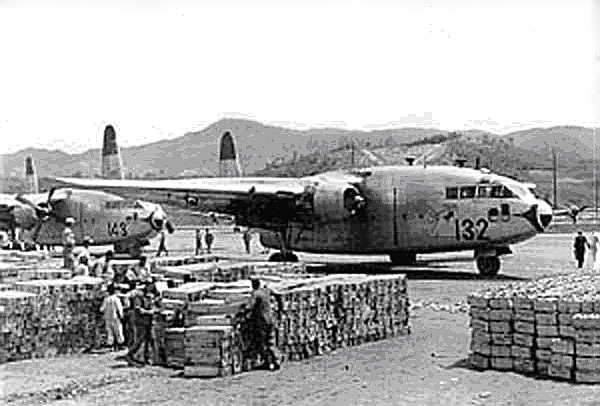 On the first of June 1956, the 311th packed up all our gear, loaded aboard C119 Flying Boxcar aircraft and moved to a Chinese Air Force base located at Tainan, Formosa (now called Taiwan). The interesting aspect of our TDY tours to Formosa is that, at that time, our government called it a training exercise for us, to train us for quick deployment. Twenty-five years later, our government finally admitted that we were there as a determent to mainland China; to discourage them from attacking Formosa. And to support Chiang Kai-shek's Nationalist Chinese military in case of an attack. At this point, it might be good to take a closer look at why the three squadrons of the 58th Fighter-Bomber Wing were keeping a constant presence in Formosa. In the late 1940s, the Nationalist Chinese Party, under the leadership of Generalissimo Chiang Kai-shek, was being driven out of mainland China by the Communists. The last refuge for Chiang's Nationalist Army was the island of Formosa. 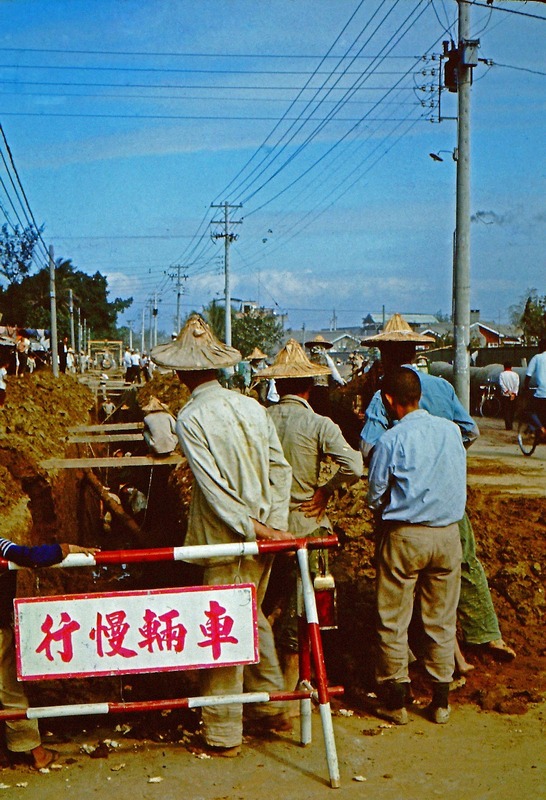 Because Formosa had been under Japanese rule for fifty years, until liberated by the Allies during World War 2, the Formosans did not consider themselves to be Chinese. Actually, after fifty years, they were a mix of Chinese and Japanese; and considered themselves independent of China, and to be Formosans, not Chinese. The Formosans did not want Chiang Kai-shek's Nationalist Chinese coming to their little island. To them, this was an invasion by mainland Chinese. Chiang sent some of his leaders and troops to Formosa to prepare the island for their occupancy. By prepare, he meant to subdue any Formosan dissent. 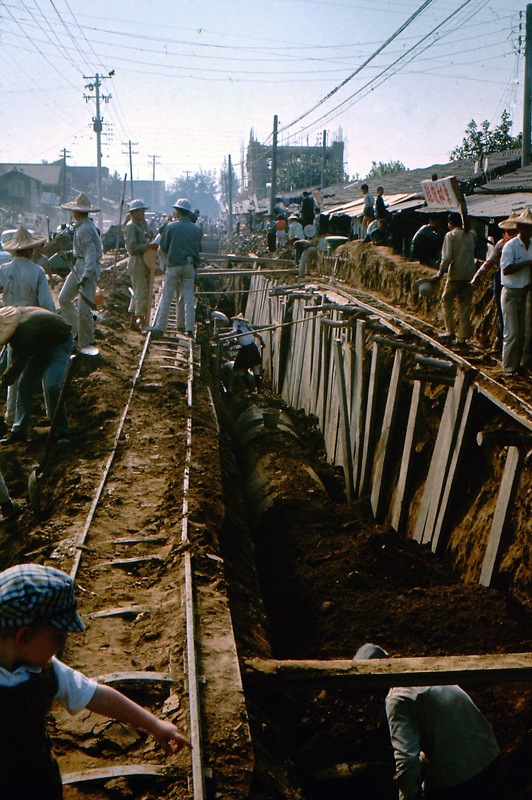 Although Chiang and his wife claimed to be Christians, possibly for U. S. political leverage, the way the Nationalist Chinese treated the Formosans was severe, as bad as any human rights charges the Western Nations have made against Communist China today. By 1948, President Truman and his Democratic Administration were ready to write off Chiang and his Nationalist Chinese Party, who, by now, were near the point of being driven completely off the mainland of China to Formosa. Chiang knew his only chance to maintain leadership of his Nationalist Chinese Party and troops was to keep his promise of returning to the mainland a constant hope. Any hope he had of returning to the mainland was dependent upon the help of America; and now America was writing him off. Two things kept Chiang Kai-shek alive politically. In 1950, Communist North Korea invaded South Korea and America became involved in the Korean Police Action. President Truman did not go to Congress to seek a declaration of war, but he had the power to send troops to aid an ally under the heading of a "police action." With the onset of the Korean War (or Police Action), Formosa became an important Asian base for America, and we had to prop up Chiang once again. During and after the Korean War, Chiang, knowing that Truman was not his champion, had to try to influence the next American presidential election. It is estimated that Chiang and his family had an accumulated $600 million to $1.6 billion war chest, mostly from American Foreign Aid. He spent a huge amount of this war chest on high priced public relations firms in America, in his attempt to influence the American presidential election. Did it work? Until then, the Democrats had been in the Oval Office for about 25 years. In 1952, General Dwight Eisenhower, a Republican, won the election and became our president. How much of this was due to Chiang Kai-shek's publicity barrage we will never know. We do know this. Chiang Kai-shek knew that the only way he was ever going to be able to return to power in mainland China was if he could get America totally involved in a war with Communist China and let America win it back for him. That was his goal; and much of his activity was aimed at getting America involved in a shooting war with China. That is why the 58th Fighter-Bomber Wing had a constant squadron stationed on a Chinese air base at Tainan, Formosa — and why there were several thousand MAAG (Military Advisory and Assistance Group) personnel throughout the island of Formosa. When I look back on incidents which occurred while the 311th Fighter-Bomber Squadron was TDY on Formosa, I can now see Chiang's hands in much mischief. The normal routine of a fighter-bomber squadron is to keep the pilots and ground crews sharp through simulated firing-bombing runs --- and to improve their air-to-air firing accuracy, a flight of four planes would go up to fire at a long white target towed by another aircraft. Each of the four planes in the exercise were loaded with 50 caliber rounds with paint on the rounds. Each plane had a different color paint which adheres to the white tow target when it is hit. The pilot's firing accuracy can be graded by the his number of hits. Obviously, when a pilot is going up to fire at a tow target, he does not need bombs on his plane. However, when the Chinese pilots, flying American F-84s, went up to fire at a tow target, their planes also carried bombs. And, surprise, surprise — the tow target must have fired back, because the Chinese pilots frequently returned to base with holes in their fuselage. And all their bombs were gone — while shooting at a tow target. 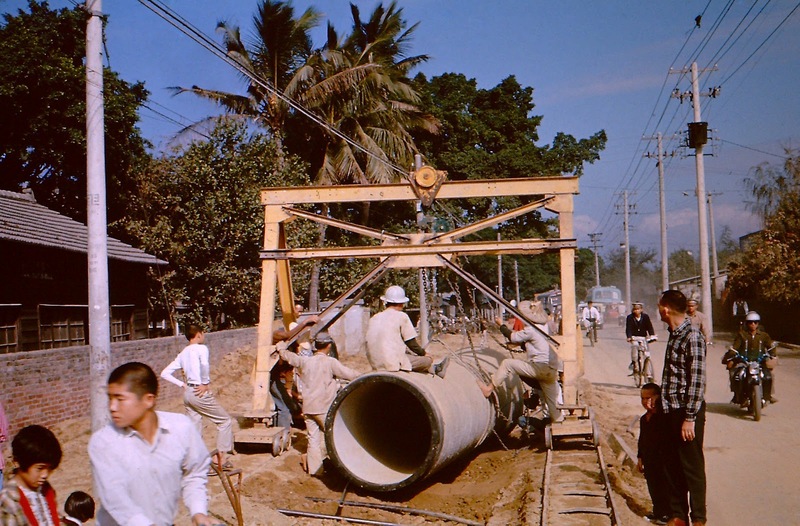 One evening, during our second TDY tour on Formosa (December 1956 - January 1957) we heard on the radio news that Communist China had attacked Burma. None of us knew just where Burma was in relation to us sitting on Formosa; but we had an idea that things were about to heat up. The next morning, as we drove down the flight line going to work, we saw about a dozen bombers. 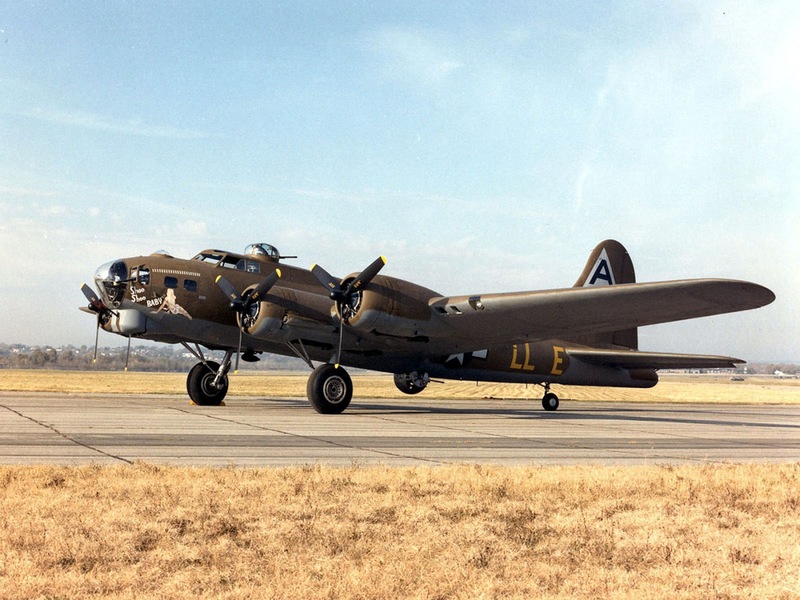 I can't remember now if they were B17s or B25s; but they were ferocious looking — with gun turrets on the top, on the bottom, at the rear, and in the nose of the aircraft. I am fairly sure they were B17 Flying Fortresses. Needless to say, this made quite an impression on us; when, overnight, there were a dozen big bombers sitting all over the tarmac --- on a fighter base. We were sure we were sitting in the middle of a war between Chiang Kai-shek's Nationalist Chinese Army and the Communist Chinese from the mainland. And being the bottom people on the totem pole, we GIs sitting on that Chinese air base on Formosa had to just wait and see. Possibly diplomacy prevented it; possibly a threat from the U.S. — but, I now know that, if Chiang Kai-shek had his way, there would have been a shooting war that day, with the U.S. right in the middle. Nothing would have made the Generalissimo happier. If you have never flown in a C-119 Flying Boxcar (they have this name because that is what they resemble, as you can see from the photos below) — you have missed an experience. We sat in web seating along each side of the plane, just as you have seen paratroopers in the movies, and the only toilet facility was a funnel looking device attached to a rubber hose and hanging on a pole in the rear of the plane. No other facilities were available. So, if you had to do anything except urinate; good luck! The story is always told, though I never witnessed it, of a gullible young GI, who was told that the plane was in trouble and the pilot had to be notified. He was told to pick up the microphone (the urinal funnel cup), hold it tight against his face, and yell a loud warning to the pilot that the plane was in trouble; but he had to hold the cup tight to his face so that the pilot could hear him. Yes, there are people who are that gullible. While Korea, still ravaged from the war, was a rather desolate place; Formosa was a tropical paradise. Actually, Formosa (Taiwan) is a tropical island off the coast of China and about four hundred miles north of the Philippine Islands. 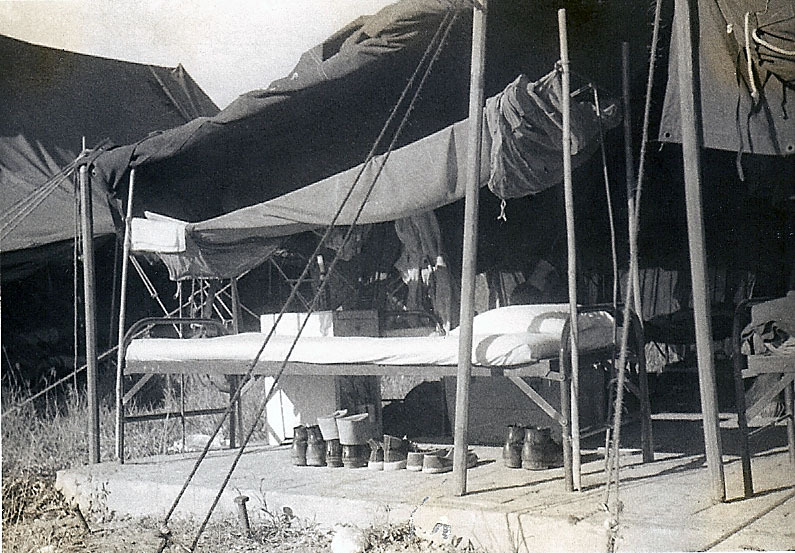 During our first TDY to Formosa, we lived in squad tents, each tent being home for about ten guys. At night we had to get into our bunks, tuck our mosquito netting in all around us, then spray mosquito spray inside the netting to get any mosquitos that had snuck in with us. One guy in our tent let his elbow slide out from under the netting one night as he slept; and his elbow was one big red welt the next morning. My bed/tent at Tainan. Shortly after this photo was taken, it was blown away in a typhoon. In the photos above you see me in front of my canvas "Formosa home." The photo on the right is me with my friend, Mark Churchill, from Lubbock, Texas. Mark was such a talented artist, I have often wondered if he made a career in the art world. If not, it is the art world's loss. Would you believe, those Converse basketball shoes I am wearing in the photo, I bought in 1953 when I played high school basketball. I still have them today — and the only sign of wear is that the toe cover is cracked. Who said the Japanese are the only ones who can manufacture quality products? 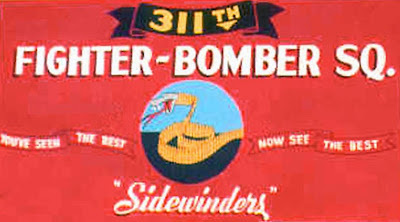 During the first four to five months I was in the 311th FBS, we had a unique claim to fame. Our Commanding Officer was Colonel Jimmy Stewart. No, not the movie star Jimmy Stewart. However, at the same time that our Colonel Jimmy Stewart was boss of our squadron, the actor Jimmy Stewart was in the Air Force Reserves; and he was also Colonel Jimmy Stewart. Our Colonel Jimmy Stewart, though, was more of a hard nose. At least that is what we thought. Why? Well, you see, we enlisted men who had access to jeeps used to love to take them over to the empty taxi strips on the Chinese air base and see how fast we could drive them. And the Colonel decided he did not like drag racing with his jeeps. 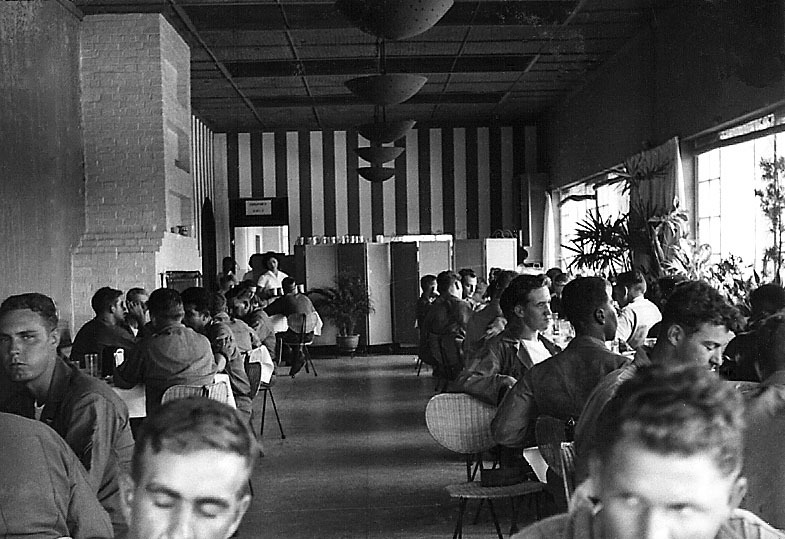 In Formosa, since we had no U.S. military facilities, we enlisted men were allowed to go to the MAAG Club. The MAAG (Military Advisory and Assistance Group) were military advisors, typically NCOs and officers, from the U.S. and other Ally nations. The MAAG Club was their equivalent of an NCO/Officer's Club; but, in these circumstances, we enlisted men were allowed to use the club also. It gave us a taste of home, since it was like a social club where we could mingle with the families of MAAG personal who were allowed to bring their families with them on this assignment. It was a comfort to be able to socialize with American families. And, for those of us who like to have a drink, it was well within our budget. As I recall, we could get a beer for ten cents and a mixed drink for twenty-five cents; a bargain, even in the late 1950s. The club had dancing and if a guy had a Chinese girl friend, he could bring her here on a date, just like back home. When you entered the MAAG Club, you were in the large ballroom, with tables and chair, and a dance floor. From the entrance, walk left, and you were in the bar area. There was a long bar, with bar stools, and the wall behind the bartender had a long black and white mural of a city skyline. I believe it was New York City. Even that mural gave one a feeling of home, of the good old U.S.A.
Then, for the more adventuresome GIs, there were the Chinese night clubs in downtown Tainan. One of these clubs was the Vienna Club. The photo below, on the left, is me standing in the Vienna Club with the owner, Jimmy. That was his adopted Western name for the benefit of doing business with Americans. I have no idea what his Chinese name was. The photo on the right was taken by my friend, Mark Churchill, when he and I wandered into the "off limits" waterfront area of Tainan, just out of curiosity. Someone should have told us that "curiosity killed the cat" — but, fortunately, we came out okay. An interesting story about Jimmy, owner of the Vienna Club. 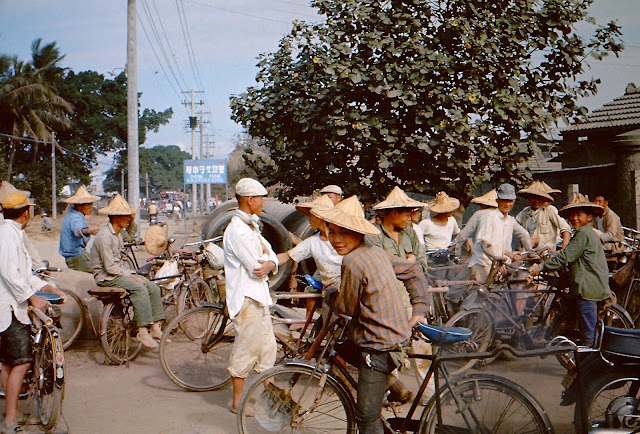 For a time, during our second TDY to Formosa, our payroll was delayed by several weeks and we were a bunch of broke GI Joes. 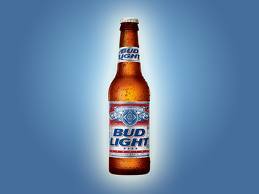 One evening, at the club, Jimmy asked if we wanted a beer. We, of course, told him we were broke. Jimmy then told us, "Don't worry, you will be paid tomorrow at 2:00 PM." 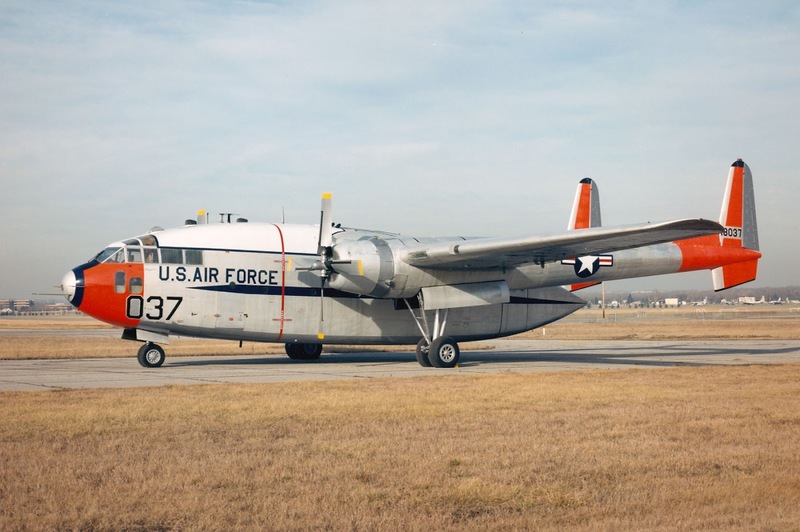 The next day, the C119 from Korea landed — and, at 2:00 PM, we were in line on the tarmac behind the C119 getting our pay. Now, the evening before, when Jimmy told us this — the plane had not left Korea yet. How did this Chinese bar owner in Formosa know that the military payroll plane, still sitting in Korea, was coming and exactly when it would arrive? So much for military security. Another comical event occurred on my first visit to Formosa. On the first day that we were allowed to go into downtown Tainan, my Arkansas friend, James ‘Smitty" Smith, and I got all spruced up and went to our GI bus — an Army 6X truck. This was our transportation to and from town; until we learned to make use of the Chinese pedicabs. On this, our first venture into the Formosa culture, Smitty and I sat in the front of the truck with the driver. As we were driving along, nearing downtown, Smitty and I saw a gorgeous, coke-bottle figure, Chinese lady wearing the typical long, form-fitting Chinese dress. We were both drooling over her figure, until we passed her — and saw that she was a white haired grandmother. We quickly learned that, over there, even the grandmothers looked good in those dresses, from behind. One of the real treats we found in Formosa, actually on the Chinese air base, was the bottled Sarsaparilla. My first TDY tour in Formosa was in June and July, 1956, and Formosa being a tropical island, the chilled Sarsaparilla was really a welcomed treat. On those hot days, we would go to a small Chinese concession stand on the air base to get Sarsaparilla and a frozen popsicle they sold. Being on a Chinese air base provided other amusing situations. The Chinese soldiers were standing guard duty all over the base and around our plane revetments. It was very common to see a Chinese soldier with a rifle in one hand and a Chinese-English dictionary in the other. One day a Chinese soldier approached me and asked, "GI, what this word?" I responded, "That word is ‘IF." And he then asked, "What it means?" I would have trouble explaining "IF' to an American — I had no idea how to tell a Chinese. From our living quarters on the air base, we had to walk past the Chinese soldier's barracks to get to the base main gate. From the outside, their barracks looked very much like enlisted men's barracks on many air bases in America. However, looking inside you could see that it was quite different. The U. S. barracks, then, typically were two story buildings with a large room on both levels. Along each side of the room were double decker metal beds, with room for our footlockers and a small close closet. In the Chinese barracks, there were two long platforms stretching from one end of the room to the other, one above the other, on each side of the barrack's center aisle. The Chinese soldiers would lay their mats down on the platforms to sleep. Another great difference between the Chinese and us; a Chinese lieutenant who was a pilot earned about $2 a month. At that time I was an A/2C and, as I recall, earning about $100 a month. If their pilots earned $2 a month; imagine what the ordinary Chinese soldier was earning. 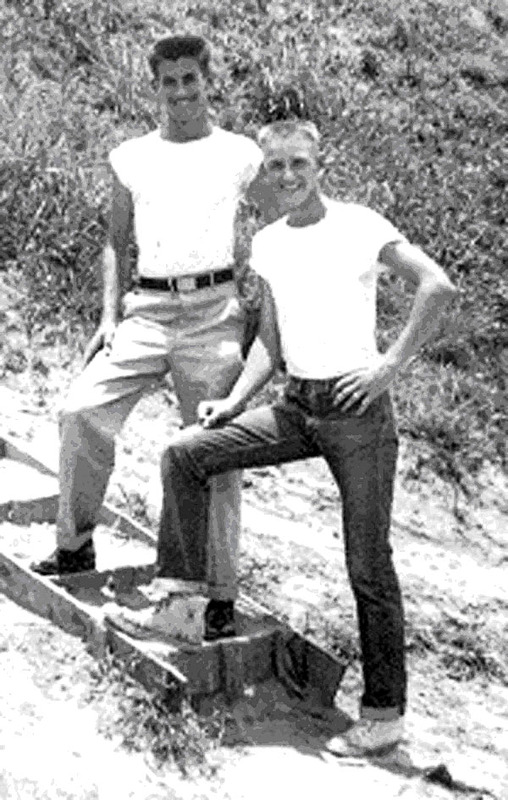 The first of August 1956, we packed up and rotated back to Osan AFB, Korea — just in time for a hot Korean summer. 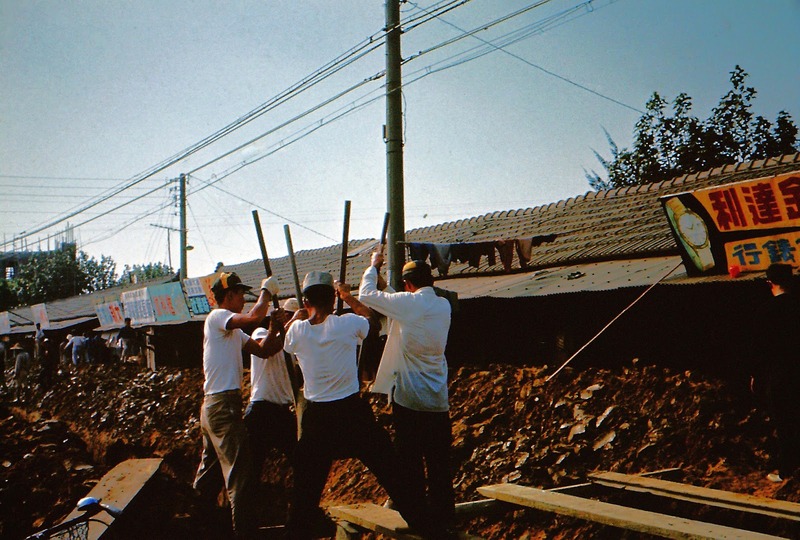 We would stay in Korea for four months while the 310th FBS and the 69th FBS did their two month stints in Formosa. 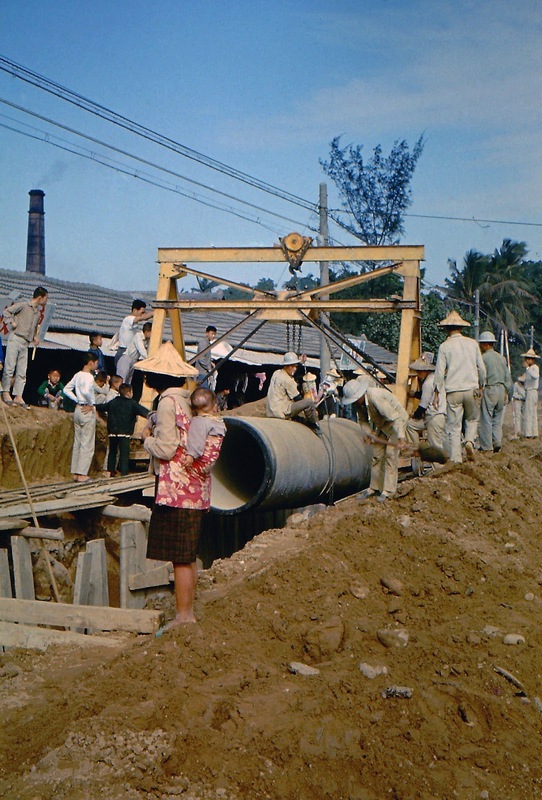 December 1, 1956, the 311th FBS packed our gear and deployed to Formosa once again. 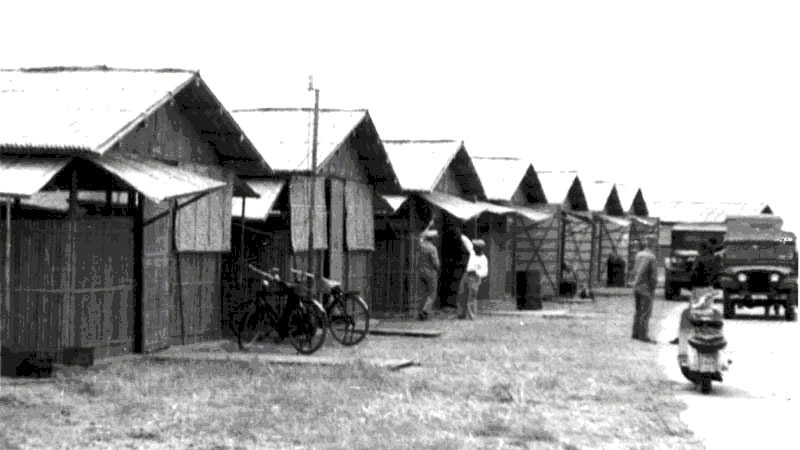 This time, in place of the ten-man squad tents, the Chinese had built us bamboo huts about the size of our ten-man squad tents, to serve as our living quarters. 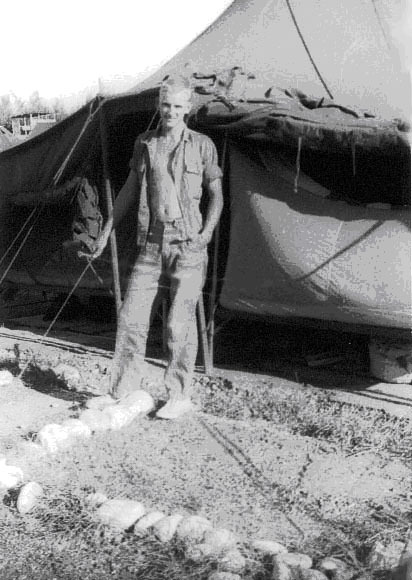 Our work shops on the flight line were still tents, for deployment purposes. These bamboo huts were nicer than the tents; however, they had one minor problem. 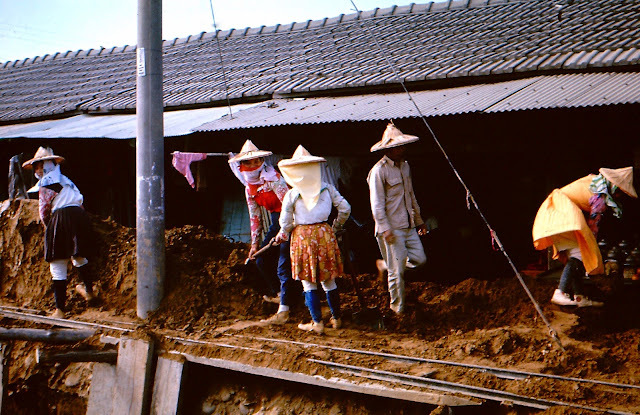 The roof, an inverted "V" shape was also made of bamboo and there were horizontal bamboo poles every five or six foot, at the base of the roof, running from one side of the hut to the other. These horizontal cross beams made great walkways for large Formosan rats. One night, as I was sleeping, I felt something fall on my chest. Reaching up to push it away, I felt a big furry rat. The next day several friends and I rented a Chinese house downtown, complete with built-in Mamasan to do the cooking and cleaning. It costs the four of us $15 USD each per month, which included the Mamasan and the food she cooked — which typically was fish and soup, the kind you see in Chinese restaurants here with bits of egg and a few green veggies floating in it. Once in a while, we had the most delicious, tastiest oranges, which were the size of grapefruits. Of course, when we ate the delicious fruits grown by the local farmers, we had to try to forget how everything was fertilized in Formosa. 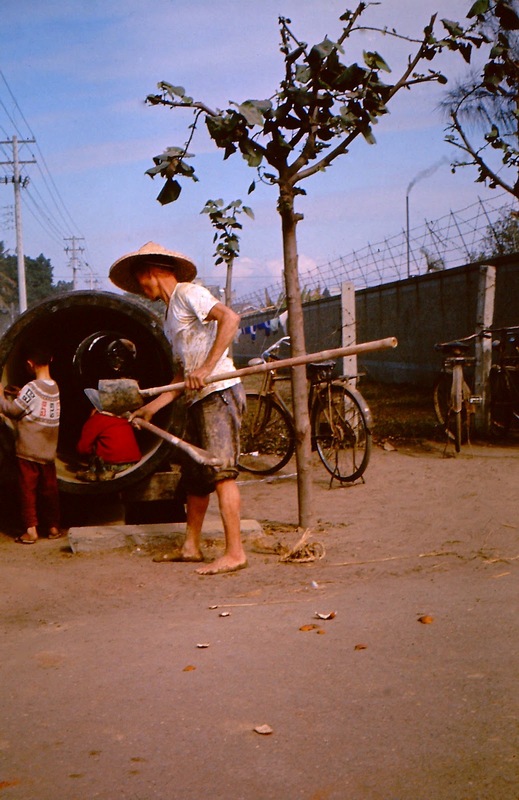 A Chinese man had the "Honey Wagon" concession on the air base. He had a wagon, drawn by a water buffalo. The wagon was like a large wooden box with a hole in the top. He would come on a regular basis and, with a bucket, clean out our toilets. You see, our toilets in Formosa were just outhouses, like on some farms in rural areas — the one with the crescent moon cutout on the door, and a Sears catalog hanging on a wire next to the hole, to serve as the family Charmin. But, to the credit of the Air Force, we did have toilet paper. Anyway, our "Honey Wagon" man gathered his goodies in the wagon and sold it to local farmers for fertilizer. When we rode in the truck driving toward downtown Tainan, there was an area of about 2 to 3 blocks along the road where we had to pass a concentrated area of farms. The farms were not the only thing that was concentrated. If you did not hold your breath for that 2 - 3 blocks, you almost gagged from the smell. It was intense! Even riding in the back of the truck with its canvas cover, we knew just about when we would hit that area. Everyone would take a deep breath before we hit it; and then hold their breath as long as possible, hoping the driver would not slow down. As I mentioned earlier, after a while, we got used to riding in the pedicabs, bicycle drawn rickshaws, rather than riding the truck into town. One day, two of my co-workers got all spruced up in their finest civilian clothes, best cologne — ready to hit the town. There were two pedicabs at the gate, so they each got into a pedicab and decided to have a race. They kept urging their pedicab driver to go faster, faster. 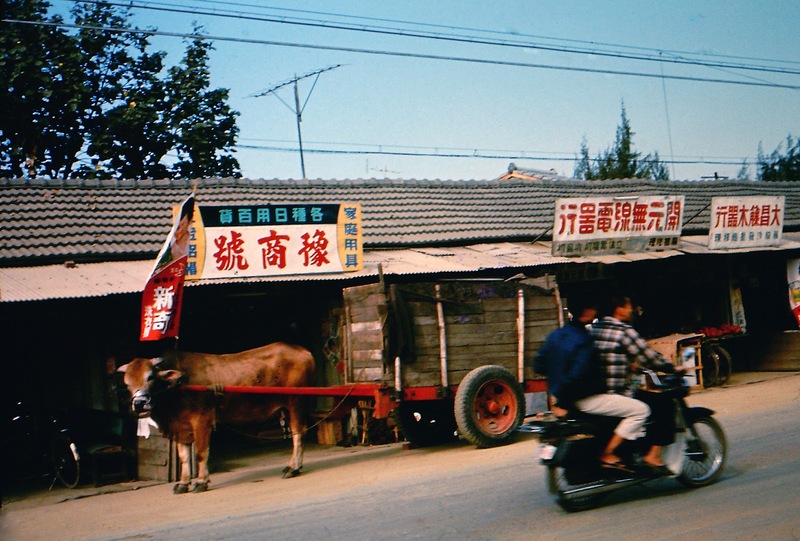 Then, out of nowhere a Chinese farmer driving his water buffalo, fresh out of the rice fields laden with our special fertilizer — crossed in front of the pedicabs. One of the pedicabs hit the water buffalo and my friend flew out of the pedicab — and landed squarely on the back of the water buffalo — in all his fertilized glory. My friends cologne did not help him much at that point. Christmas day, 1956, several friends and I went into downtown Tainan, to one of the Chinese bars. Being early in the afternoon, there was no one there except the owner and his family. The bar had an upstairs section with a dance floor. By the dance floor, they had a Christmas tree. I don't know if it was for the sake of we Americans or if they truly celebrated Christmas. I took the owner's son, about 3 or 4 years old, put him on my shoulders and we went upstairs to see the Christmas tree. Funny, I could not understand a word the child was saying; but he was so excited about the tree, I felt that I knew what he was feeling and what he was saying. 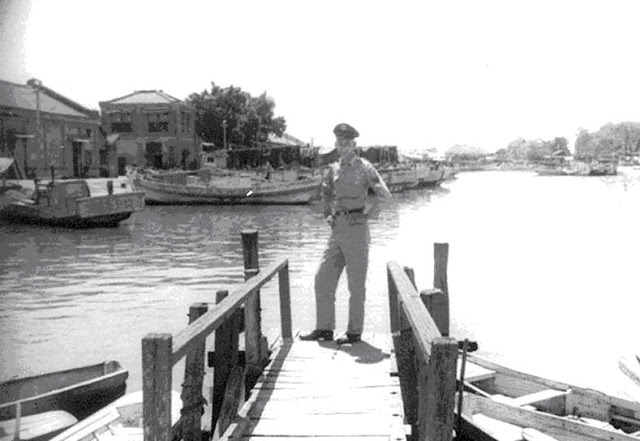 On our second trip to Formosa, our Commanding Officer was Colonel John Back. Over the Christmas weekend, Colonel Back left, possibly to Japan. I don't know. But, he left orders that, over the Christmas weekend, only half of us could leave the base. Normally, there were no restrictions about who could go into town, as long as we were back in time for duty in the morning. Colonel Back left Major Simon "Andy" Anderson in charge of the squadron while he was gone for the weekend. As soon as Colonel Back was gone, Major Anderson gave everyone permission to go into town. I mentioned that, of all the officers I remembered well, the first was Lt. Bob Ford, for the kind of man he was. The other officer I recall very well was Major Anderson. He was a veteran of the Korean War, and as I understand, came very close to becoming an ace. I believe he got four MIGS. Anyway, he was an experienced, capable, very confident pilot. While all the other pilots came to their plane looking all military spit and polish, Major Anderson typically came out with most of the zippers in his flight suit open, and a baseball cap turned backwards — and this was 1956, not 2004. The enlisted men always joked that the reason Major Anderson's flight suit zippers were always open was that he had candy bars and comic books in them. Now, let me say, that was the rumor; I cannot personally confirm it. However, there is one rumor that I can definitely confirm. The guys always talked about Major Anderson not using his radar/fire control sighting system; but instead using "Kentucky windage" — which was when the pilot stuck a wad of chewing gum on the front windshield of the cockpit and used that like a rifle shooter uses the sight on his rifle. Normally, the radar/fire control system imposes a circle of light dots on the windshield, with a crosshair in the middle. As the pilot came nearer to his target, the circle of light, called a reticle, will grow smaller and the pilot centered his target up in the reticle with the crosshair on the target plane. As long as he held that position, the radar/fire control computer would calculate such things as wind velocity, distance, arc, lead time, etc., to give the pilot the best opportunity for a kill. With Kentucky windage, you point the plane like you would a rifle, get your "chewing gum" sight on the target plane, and fire. As I said, I can confirm this rumor. Our twenty four F-86Fs were separated into flights of eight. I was responsible for the radar/fire control system for one of the flights of eight aircrafts. Major Anderson's plane was in my flight. One day, as he was going up for a target firing run, I knew before he took off that the radar was dead in his plane. If he attempted to turn on the radar/fire control system, he would have no reticle on the windshield. The system was totally dead. But, rather than say anything about this, I pretended that everything was okay; and when Major Anderson returned from his flight, I drove out to the plane and called out, "Hi Major, how was the radar/fire control system?" He smiled and yelled back, "It worked just fine." Hmmm, not in that plane it didn't; not that day. Another amusing story happened while we were in Korea. After each flight, we would go to each plane and check the pilot's log book. If there was a problem with the radar/fire control system, or any other system, the pilot would write it in the log book. We would get into the cockpit, turn on the radar/fire control system and run the limited tests we could on the ground. As I said before, when the pilot is flying, the reticle (circle of light dots) will get larger or smaller, depending upon the distance to the target plane. The pilot locks onto the target, keeps the enemy aircraft in the crosshair, and when the reticle is about the size of the target plane, the pilot fires for a sure kill. However, sitting in the cockpit, on the ground — no matter how much I daydreamed about being in a dogfight at 20,000 feet — there was no way to fully test the system. So, when we could not find a problem, we would write in the log book, "Ground check OK."
One day, our Commanding Officer came into our radar shop with fire in his eyes, "Who is Airman Gray?" "I am, sir," I answered. "What do you mean, ‘Ground check OK'? If an officer says there is a problem, there is a problem. And don't you dare call an officer a liar! Do you understand?" From that day, anytime I could not find a problem on the ground — I just wrote in the log book, "Replaced fuse F1." And I never had another complaint. 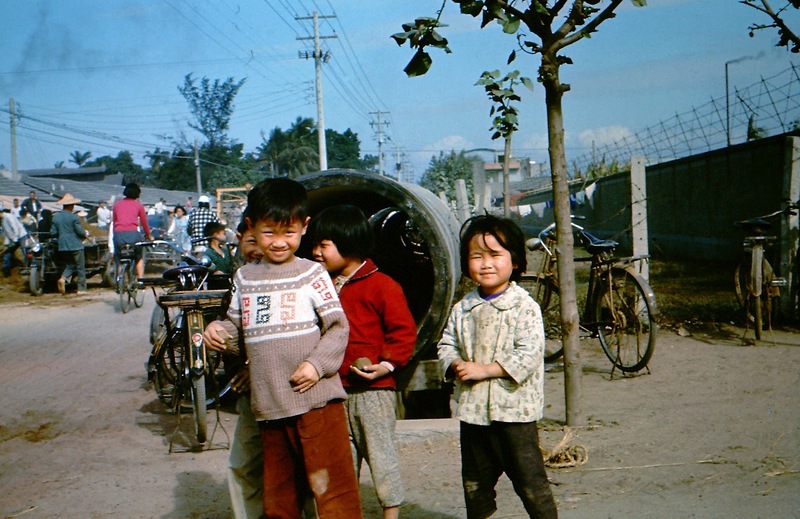 Thank you Bill for sharing these beautiful memories of your days at Tainan Air Station. This month, June 2012 would be the 56th anniversary of you first TDY at Tainan Air Station. 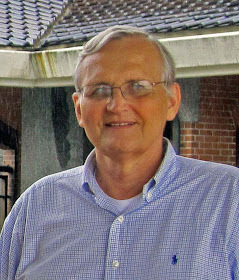 If you would like to view Bill's Web Page, please click HERE. 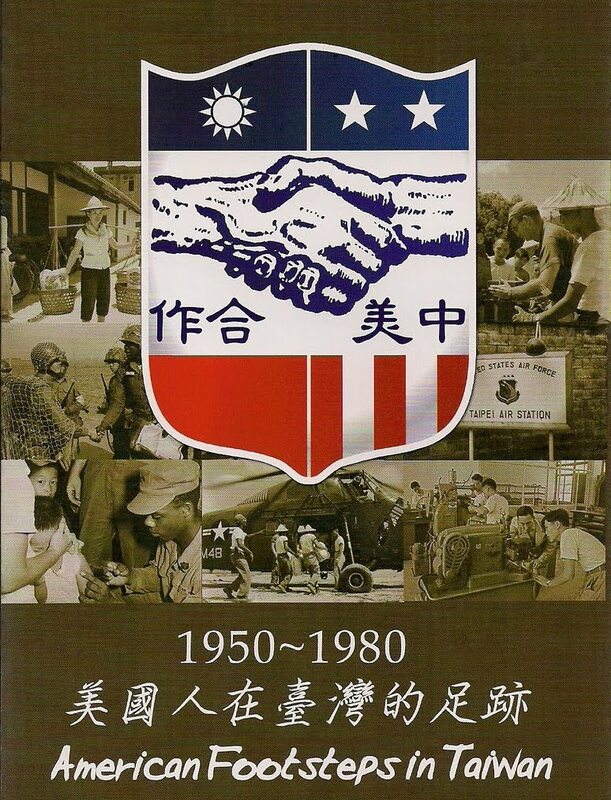 It's Time to Read the History That Brought You and I to Taiwan..
A friend forwarded a link to me which goes into great detail on background events prior to the establishment of MAAG Taiwan. I was in the dark on much of this history, some has probably been published elsewhere, but I have not read it. You won't believe how things came about in those early days after Chiang moved his government into Taiwan. Take a chance, read the article, you'll be surprised. I received this photograph in the mail today. It was taken in Taiwan. Rather than tell you where it was taken, lets see who can ID the photo. I'll let the answers accumulate until Monday, 22 June. Leave your answer in a Comment below. 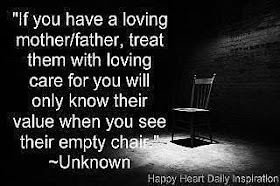 Have a great Father's Day.. It was taken at the MAAG Club outside of Tainan AS. I thought someone from Tainan may have recognized what looks like a brick fire place on the left wall of the photo. Breakfast time, probably a Sunday morning in 1956, as I remember, in 1959 we were working on Saturday mornings until noon unless there was an Inspection of some sort. Bill Writes..." To the left in this room was the bar which had a black/white mural of the New York City skyline painted on the wall. And going through the door in the upper left, where the waitress is standing, would take you to the main ball room where we danced the night away. U.S. Flag sits on and overlooks old HSA East Compound in Taipei. Chung Shan North Road runs just to the right of this photo. This photo was taken in January 2011. 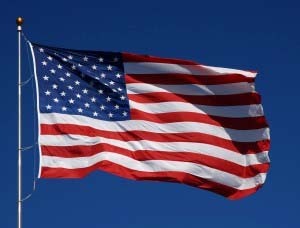 Flag Day, a time to remember our country, flag and history. How many times did you come out the old gate? HERE'S Bob Schieffer and band performing a special song at the National Museum of American History. Yesterday, I headed out on my bicycle, peddling over to the Xindian River. As I moved onto the river path, it was already close to 90 degrees F. I took my time, stopping along the way when shade was available to cool down and refresh with a drink of water. As I moved farther down the river, I had a change in plans. I decided to take the new bridge across the river and try filming my ride as I traveled the bike path. The results are captured in the two videos below. The first video begins on top of the new bicycle and pedestrian bridge over the Xindian River a mile or so north of Green Lake. The second film is a continuation from where the first video stopped. The videos were taken at eye level, as I moved north along the river paths. This is a different way to explore and see the area, hope you find the ride enjoyable and see something along the way you haven't seen before. 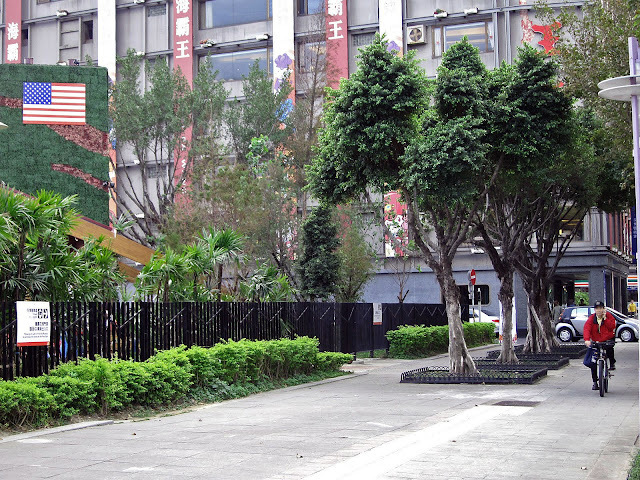 Most of you who were stationed in Taipei probably visited Green Lake at one time. The old highway to the lake would have taken you right past Taipei Air Station and onward down Roosevelt Road toward Green Lake. Next time, I'll bike all the way to Green Lake, and we'll have a look around the area, the area facilities are really nice today. Let me know if you would like to see more of these type of films from the bike angle.. Yesterday was the anniversary of the Invasion of Normandy during World War II. A wonderful story was told by Steve Hartman, in his "On The Road" series, during the CBS Evening News. This story touched my heart, bringing a tear to my eye. You'll feel it also.